The latest issue of UK based Resolution Magazine (September 2010) contains a very nice review of the Milab DC-96C written by microphone guru Jon Thornton. "This is an extremely capable little microphone, and a pair of them would undoubtedly cover nearly every base. … It's a great example of how a classic design can and should be reinvigorated." You'll find more quotes on the DC-96C review page. The first review of the DC-96C was published in Swedish Pro Audio magazine MM a couple of weeks ago. "It seems obvious that the DC-96C would be an excellent mic for stereo recording - probably just as good as a small diaphragm condenser." "When I switched to the DC-96C recording I almost fell out of the chair." "The steady bass reproduction has been impressive throughout the entire test." "It seems as harmless as Clark Kent when I set it up in front of the different sound sources. But when I turn my back on it and make my way to the control room, it transforms itself - and comes out like Superman in the studio monitors." "With its silky smooth top, its neutral mid range and a low end that can only be described as gigantic - the DC-96C is an extremely useful tool for any serious recording engineer. A matched pair of DC-96C:s ought to be one of the best foundations imaginable for any mic collection." More excerpts can be found on the Milab blog. The Milab distributor for North America, FDW-Worldwide, has just launched a dedicated Milab website for our fans in the USA and Canada. Check it out at www.milabusa.com. 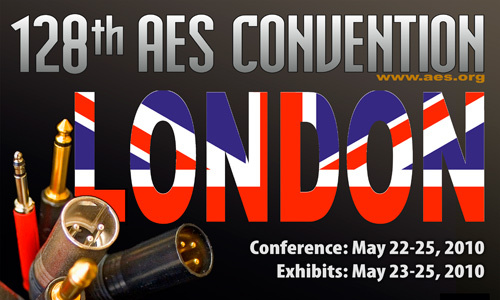 Milab will take part in a workshop called Single-Unit Surround Microphones at the 128th AES Convention in London on May 25th. Marketing Manager Mattias Strömberg will be one of the panellists and will demonstrate the Milab SRND 360 surround system, including sound samples.